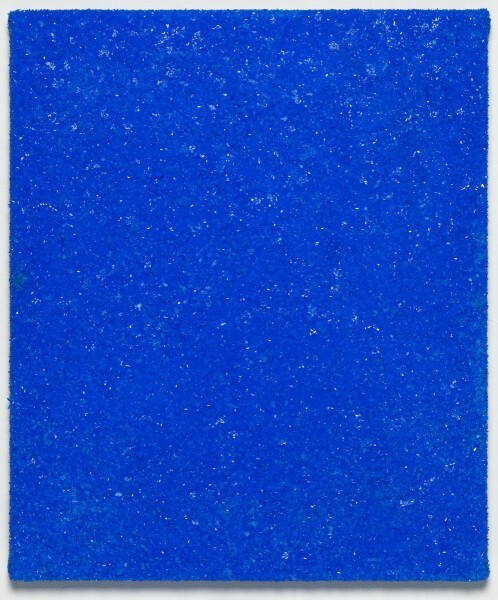 Roger Hiorns, Untitled, 2015, copper sulphate on canvas, 31 x 25 x 3.5cm. Courtesy Corvi-Mora, London. Photography Marcus Leith, London. Roger Hiorns - Installation View, Corvi-Mora, May 2015. Courtesy Corvi-Mora, London. Photography Marcus Leith, London. 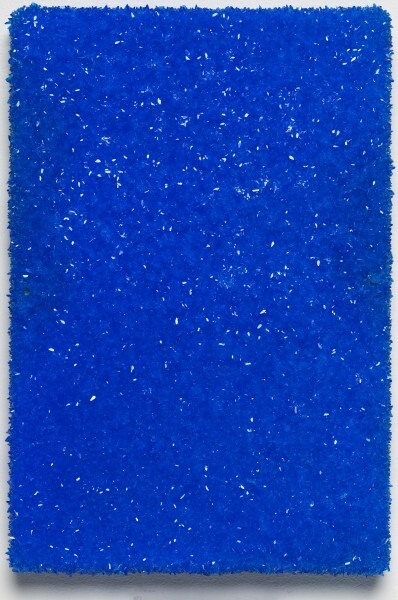 Roger Hiorns, Untitled, 2015, copper sulphate on canvas, 61 x 51 x 3.5cm. Courtesy Corvi-Mora, London. Photography Marcus Leith, London. Roger Hiorns, Untitled, 2015, brain matter and copper sulphate on canvas, 41 x 41 x 3.5cm. Courtesy Corvi-Mora, London. Photography Marcus Leith, London. Roger Hiorns, Untitled, 2015, copper sulphate on canvas, 41 x 31 x 3.5cm. Courtesy Corvi-Mora, London. Photography Marcus Leith, London. 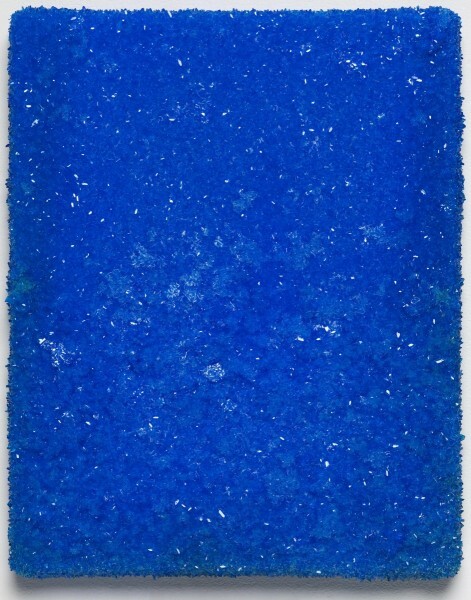 Roger Hiorns, Untitled, 2015, copper sulphate on canvas, 31 x 21 x 3.5cm. Courtesy Corvi-Mora, London. Photography Marcus Leith, London. Simplicity is a paradoxical thing. One becomes wary, with experience, of presuming that works that ostensibly operate in a straightforward way are as innocent as they seem. The more one can talk to artists, the more it is to understand the complex routes taken to the endpoint that manifests in a body of work, an exhibition. Walk in to the cool, top-lit ground floor space at Corvi-Mora right now and you are likely to experience a jolt of keen optical pleasure. 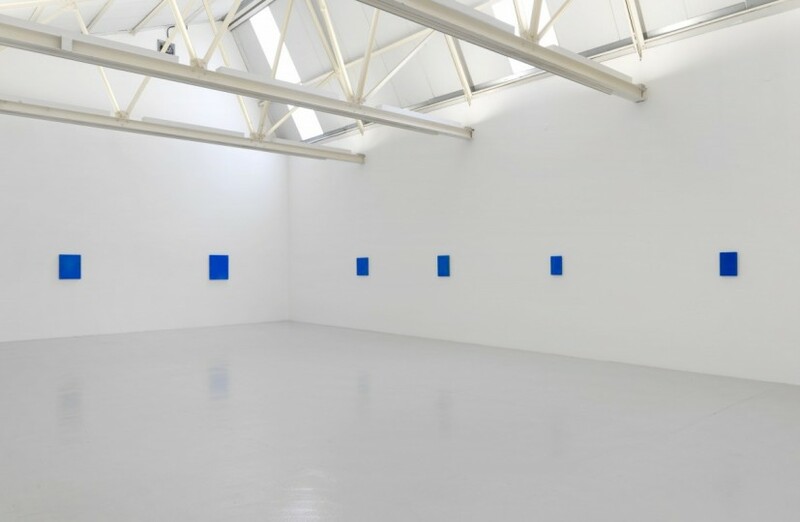 Under diffuse, uniform lighting, twelve small panels of the intensest, almost luminous blue hang on the walls. 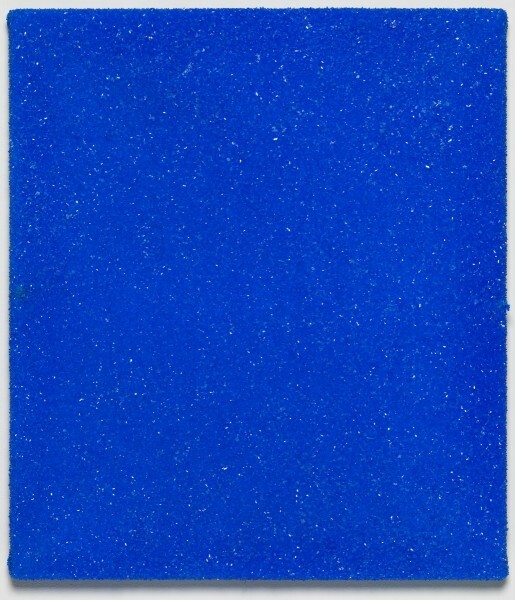 This is the heavenly blue of the Madonna’s robes in Renaissance painting, the Mediterranean high-summer skies of the 1950s that were the source of Yves Klein’s YKB International. Only it’s not, of course. 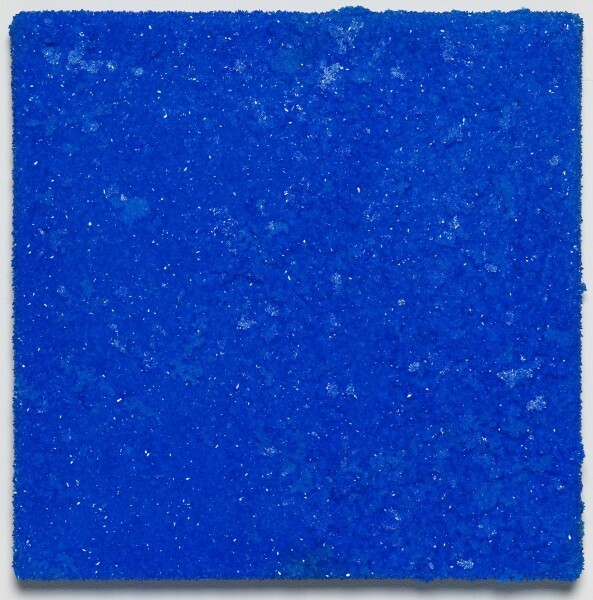 This is the blue copper sulphate crystal that Roger Hiorns has employed since the late 90s – on architectural models, aircraft engines and most famously for his 2008 Artangel commission Seizure. In considering this latest exhibition, one might view it as part of a trilogy of shows the artist has done with his London dealer over recent years: 2008 saw the fine dust that was an atomised aircraft engine become a barely-there greyscale field across the floor of the gallery. After 9/11 our relationship to aircraft can never be the same, but Hiorns’ repeated use of engines is about the intimate connectedness of mankind and machine, the wider political and industrial systems that control our lives. 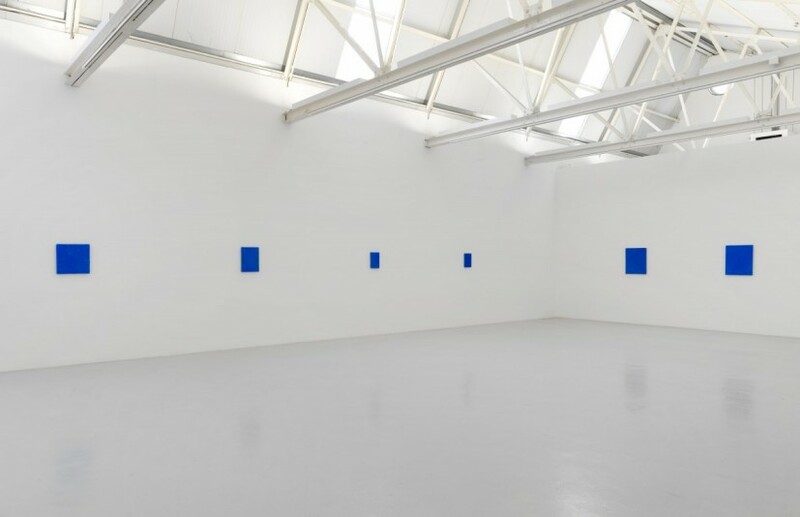 2012’s exhibition was an austere collection of wall-mounted, plastic panels ‘painted’ with yellow-brown “brain matter” – a term at once scientifically specific yet creepily ambiguous. Then there is the artist’s contribution to the just-closed History is Now exhibition at the Hayward Gallery. A dense, closely researched investigation of the BSE and related CJD crises that gripped the UK in the 90s, this was Hiorns’ unpacking of a moment of recent history that deeply affected his own generation with a pervading sense of dread. Spurred by a personal determination to peel back the surfaces of forgetting that have obscured this inglorious episode, the work revealed the governmental strategies to contain the crisis and control public responses to it at the time. 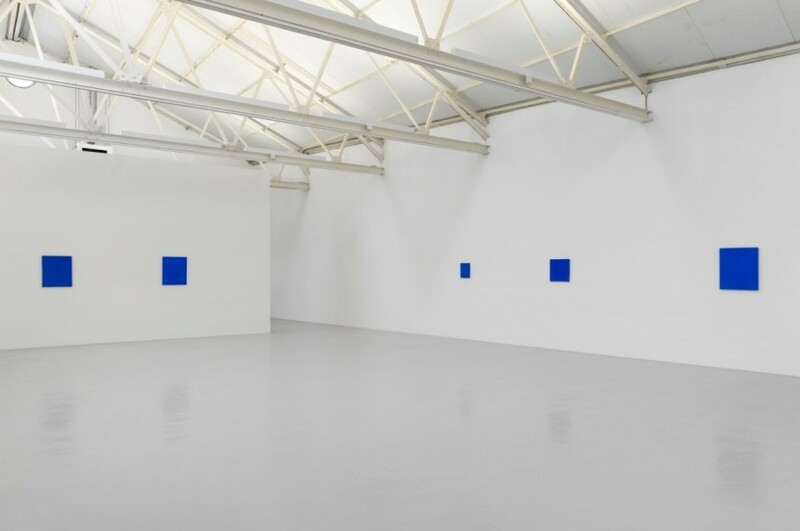 So it is via all these ideas that we approach the eleven blue panels in the current show. They are, radically, works on canvas. 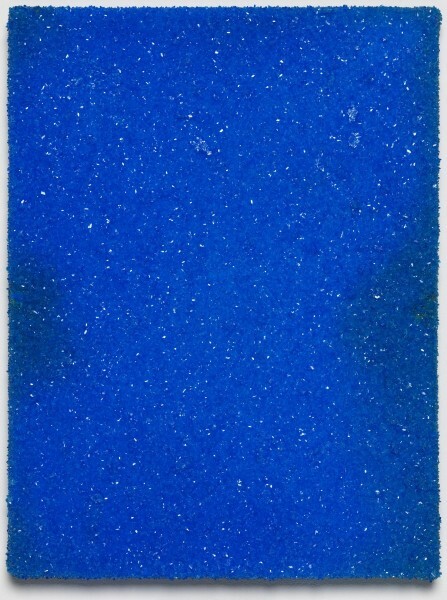 Blue copper-sulphate crystals grown finely across the surface, one becomes entirely focused on the chance variations in the crystallisation from one canvas to another. Occasionally the crystals have grown beyond the edge of the canvas, in some panels there are greenish spots where some other element has acted. They are undeniably, quite simply, very beautiful. An additional experiment here, something the artist describes as “material research forming new technology”, on a single square canvas the crystals have been grown on the aforementioned brain matter. The crystal’s point of creation is the synapse and the neuron, on a pale canvas support that seems to throw light through the crystals so that they have a low, glittering life in them. Hiorns describes the crystallisation as a system of nature grown over the traditional canvas support. Innocent these are emphatically not, and JPEGs will never express the see-saw effect between the sublime and an aura of faint malevolence that one experiences in their presence. In their apparent simplicity they are a distillation of sustained thinking about the forces bearing upon our age. The show was completely sold out before the opening of course, so get in line, people.